Buy 12 or more for $12.82 each. God Gave Us the Bible introduces kids to the STORY of stories---the love story between God and his people. Ideal for readers aged 3 to 7, written in a framework where Little Cub and her animal friends reflect many of the questions young readers have about Bible stories. The book features forty-five Bible stories and concepts that every child should know/be introduced to, like Noah and the Ark, the Birth of Jesus, and Jesus Feeds the 5,000 in a very warm, conversational, reassuring manner. 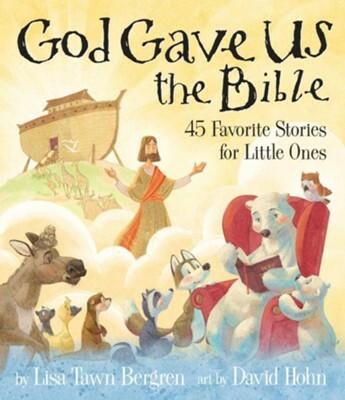 I'm the author/artist and I want to review God Gave Us the Bible: Forty-Five Favorite Stories for Little Ones.